The elegantly curved blade of the Warcraft tanto made from U.S CPM 3-v High Carbon offers a sturdy, flat cutting edge which will delivery devastating blows. The tip has been sharpened by hand to a extremely sharp point allowing for deep penetration with minimal force. The Warcraft blade has a Diamond Like coating on it which creates a scratch resistant surface. The DLC also helps reinforce the blade making it incredibly hard and reduce the friction making it easier to use. 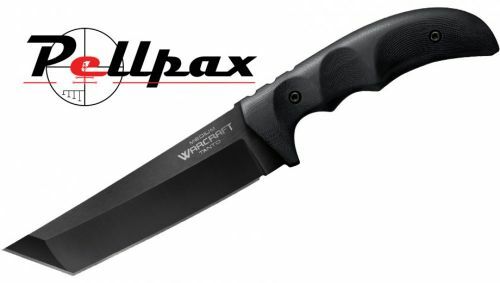 The Warcraft Tanto is fitted with a 4.75" long G-10 handle.The curved shape of the handle fits perfectly into your hands allowing for a grippy yet comfortable use. The long 7.5" blade is 5mm thick and weighs in at only 13oz. This makes it ideal for carrying around wherever you go. To further this, the Warcraft Tanto come with a Secure-Ex sheath allowing you to store your blade safely and preventing damage to it. Add this item to your basket & spend an extra £236.01 to apply for finance.